Angle grinder diamond blades are used on electric circular saw and angle grinder for multiple purpose cutting applications. 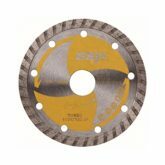 Generally there are three type of dry-cutting angle grinder discs for concrete in accordance of their rim: Segmented Diamond Blade, Turbo Blade and Continuous Rim Diamond Blade. 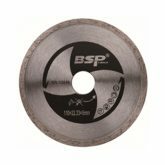 For use on electric circular saw and angle grinder. Smooth cutting on variety tile, masonry and stone. Good performance on medium hard construction material, reinforced concrete, brick, stone. 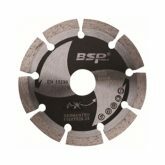 Smooth cutting on tile, masonry and stone. 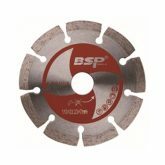 Cutting on construction material, reinforced concrete, brick, stone. 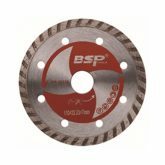 BSP tools manufacture provide sintered blades (cold pressed), mostly used in angle grinders for DIY market, which is divided into the premier ,standard and economic .That can be application: construction materials ,brickwork, concrete ,reinforced concrete, natural stone .for use on electric circular saw and angle grinder. the diameter is from 105—230mm. 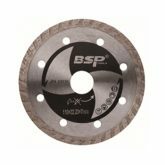 BSP TOOLS can silk printing ,laser engraved and label on the surface of diamond blade. 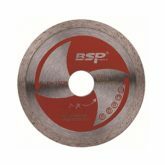 BSP TOOLS Special blade segment size and shape are available which is according to the customer request . 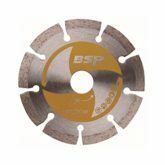 BSP TOOLS offer wooden case ,color box ,white box and brown box for the package for bigger size . 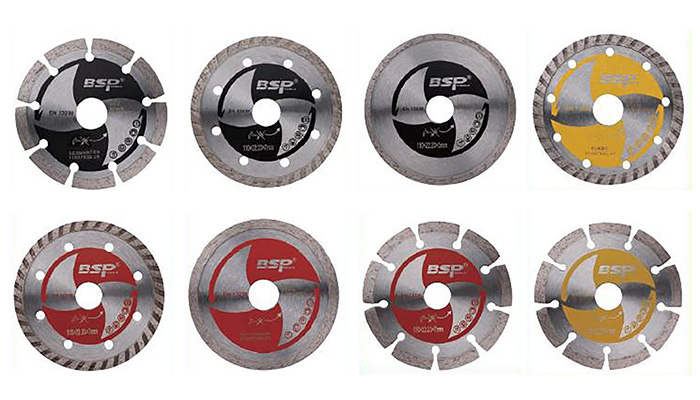 BSP TOOLS offer color box ,single blister package and double package for small size diamond blades . Samples can be sent within one week and bulk order can be finished within 40 days . 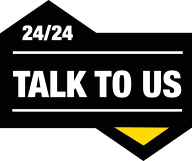 Better tell us the power of your cutting motor /hand held cutting machine /and RPM request if you have specific cutting request .